Sometimes you ask something expecting to be told no. When Kris and I said we wanted to stay on ~Flow overnight as part of our residency, we expected a polite ‘no chance’. Health and Safety laws, after all, usually get in the way of anything that looks like being recklessly enjoyable. To our surprise and delight, we were told yes. We had to agree to wear life jackets at all times, not to clamber over the safety rails and sign a letter absolving anyone else of any responsibility were we to endanger ourselves through our own foolishness. We picked up the keys from the slightly bemused Duty Manager at the end of the day on Sunday and he showed us the idiosyncrasies of the various padlocks, took us up to be introduced to the overnight security team, then wished us luck.We left our supplies and met with the poet (& WATT writer in residence at The Sage, Gateshead and the Tyneside Cinema) John Challis for a final hot drink. John joined us on ~Flow for a supper-picnic and debate over the relationship between writing and self, then left us to our own devices. I had all these expectations for the ~Flowvernighter. I thought we’d lie on the deck and watch the stars in the silence of the early mornings. I expected my imagination to be stirred by the dark waters lapping around the mill. I thought I’d come away in the early morning tired but happy, with a draft of my Mermaid story sketched out. As it was I’d been travelling a lot for work in the run-up the the evening and was only actually in Newcastle for about 36 hours before disappearing again. Pre-tired, my mind full of other things, I sat on the deck with a rug over my knees and I felt blank. I knew the story I wanted to write, but I didn’t feel I was adding anything to it by being there, didn’t feel I was finding any of the details I’d hoped for. 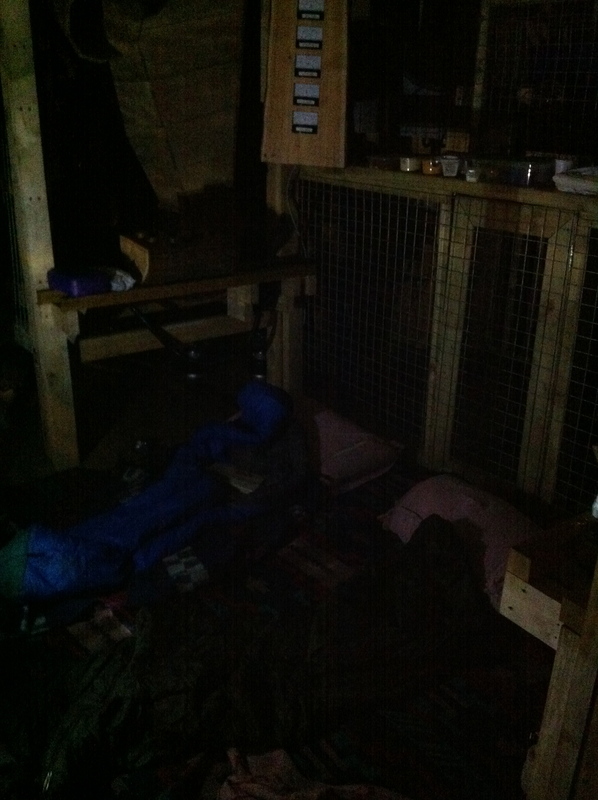 We packed away supper and decided to sleep in the most waterproof part of the MillHouse, just in case. 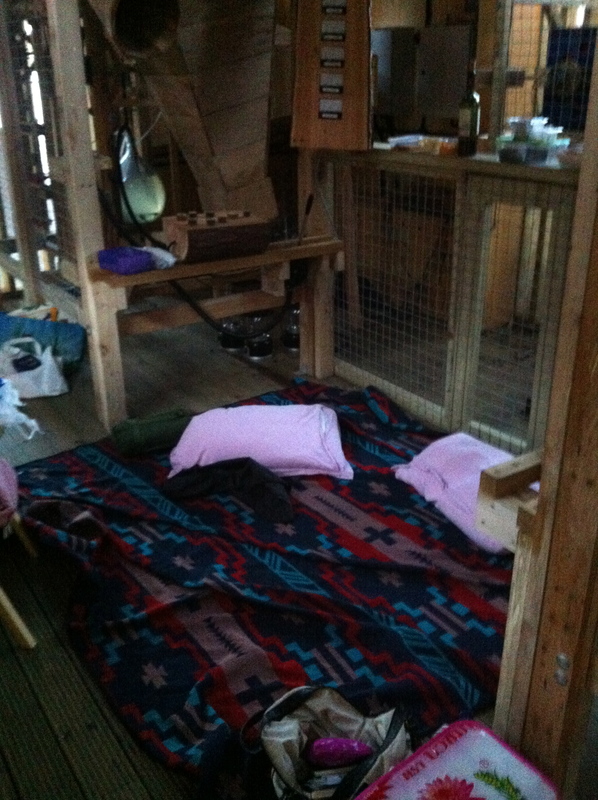 Kris got into her sleeping bag and I wrapped myself in some rugs and we went back onto the deck. The light was starting to leech out of the sky, but it was still bright enough to read by. We sat in mutual silence and read. Out of a vague sense of annoyance more than anything else, I started noting down bare facts in my notebook- how the birds sounded. The lights on the Bridges coming on. How many people were around. I got up and switched the speakers on. I got up five minutes later and switched the speakers off. I had a sheaf of notes with me from an engineering talk about ~Flow a couple of weeks before, by Andrew Walker of Buro Happold. I had a print-out of the script Kris and I have been co-writing for our residency at BALTIC, scribbled over with edits to discuss. Both these stacks of paper stayed in my bag for the whole trip- I still don’t know why. It was only when the light was starting to be too grey to read by that I got my first line: ‘the gilding is quick to fall away from the gingerbread; the larch bark edging comes off first, peeling in whole, short strips from the casing of the mill house‘. I began to imagine how it would feel for my engineer to be sitting on ~Flow, watching the lights of the city for the last time before he was towed away out to sea. The story was supposed to be darkly funny, but I couldn’t imagine anything funny about actually having to suffer what he’d go through in my story. The narrative clicked in my head from being a story that contained this engineer to being a story about his experience. The descriptions I wrote down began to mirror that, becoming more subjective. Kris was also alternating reading and writing. It’s only as I write this up that I realise I never asked her what she was writing about. We pointed things out to each other, occasionally, but mainly we sat in silence and ate her home-made-fudge. I thought about how this deck would feel to someone who had nowhere else to sit, no home to go back to, no way of escaping. 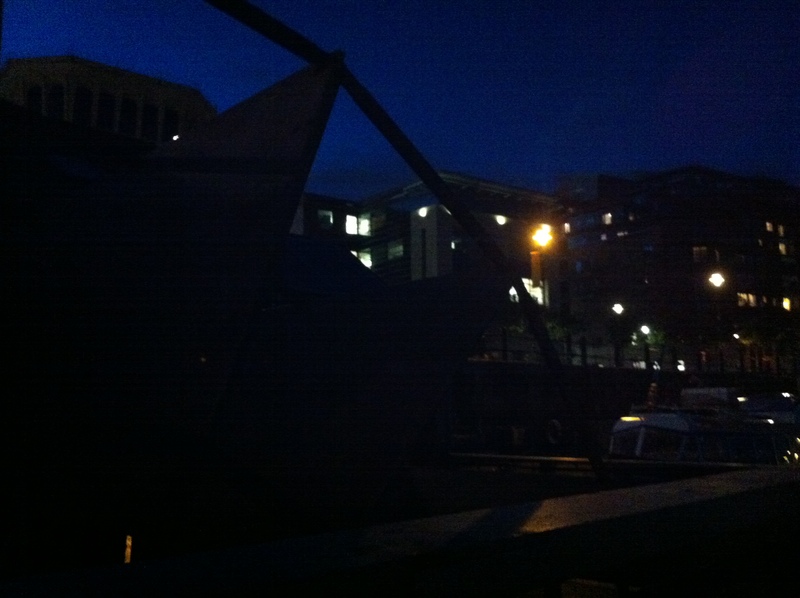 More importantly I learnt that it never gets quiet, never gets fully dark. 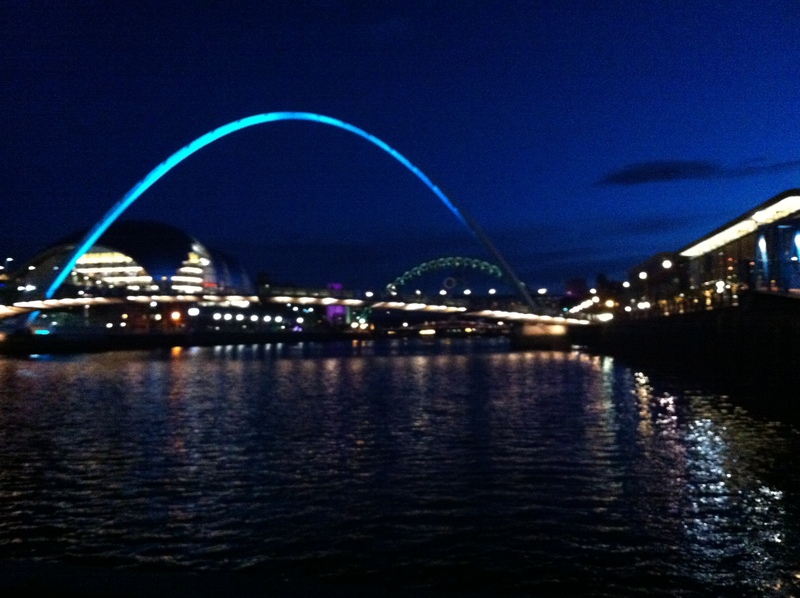 The cacophony of lights on the bridges, from the buildings along the quayside. That kittiwakes never shut up. 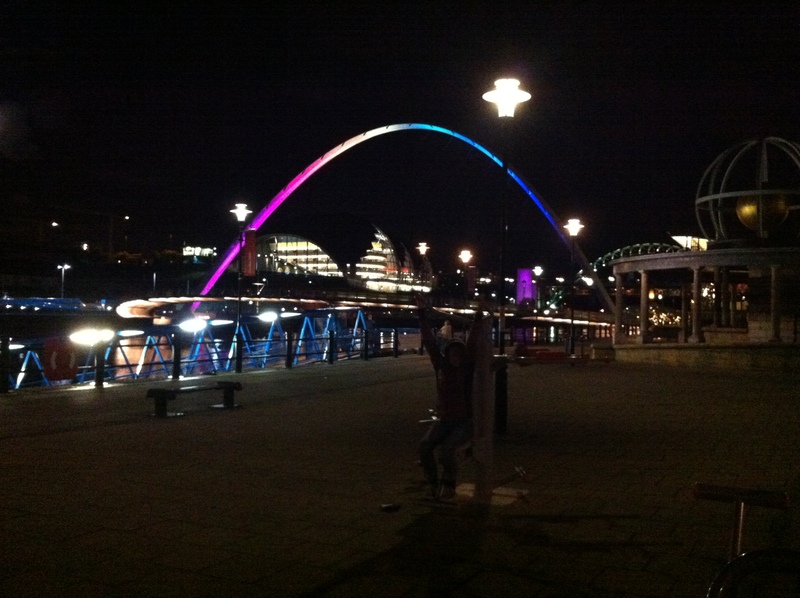 Even on a Sunday night there are loud parties of drunk people on the quayside. Laughter carries a long way in the night air. I still wasn’t writing a story though, just more focused ways of describing what I was experiencing. The moon came up so round and bright we mistook it for a security light on top of a block of apartments at first. The traffic noises were distinct from the trains and the police helicopters. I walked around the deck, admiring how it looked. It had been a warmish afternoon, but the evening was cold. We became aware that there was no real indoor space on ~Flow. I began to think that bringing my camping chairs wouldn’t have been such a foolish idea after all. The tide changed and the wind died down. At half elevenish we decided to stretch our legs before bed. We locked up ~Flow and used the bathrooms at the Pitcher & Piano. I hadn’t felt cold exactly until I put my hands under the hot tap. 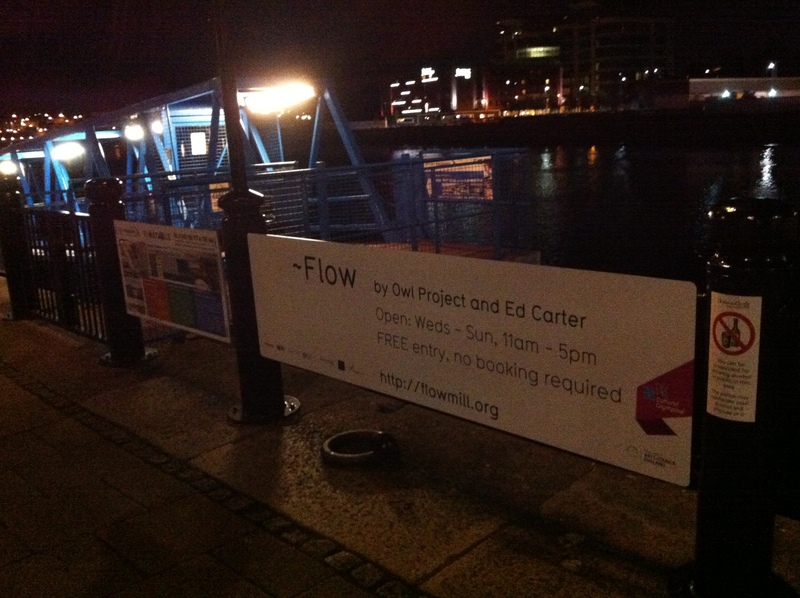 Kris and I had been joking about ~Flow being our city-centre boutique hotel. So we visited the leisure facilities for a quick workout- the public gym equipment conveniently placed opposite ~Flow on the quayside. Back on board we locked ourselves safely in, then brushed our teeth out on the deck. The nose and the lights were a little emotionally upsetting- we talked about how we both automatically thought of ~Flow as a non-urban personality. 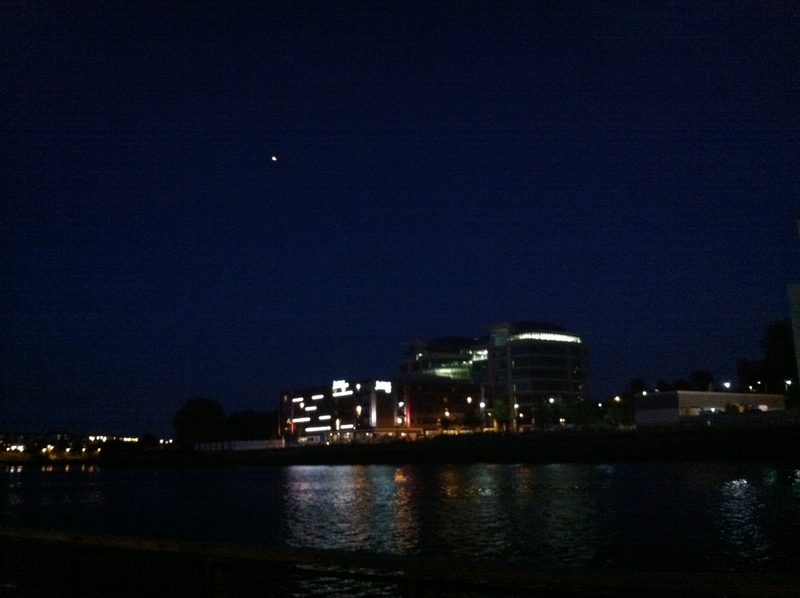 The stars were out, but only in a city fashion. When Kris and first came on ~Flow we thought of it as a house, and we had the same reaction of wanting it to be self-propelling (initially thinking the water-wheel might be able to function as a sort of paddle-steamer. It can’t). We wanted it to be able to travel- it floats, but only in a specific, static place. In my head floating things are boats and boats are built to move. And houses are meant to be lived in; at least we were living in ~Flow, temporarily. We were both ready to sleep. Lying in my sleeping bag in the Mill House, I discovered what perhaps had made everyone else so surprised we wanted to stay on board overnight. The walls are made of slats. The windows have no curtains. The walls aren’t really walls, they’re more like fences with occasional doors. Inside ~Flow was slightly more protected than being out on deck, but not by a great deal. 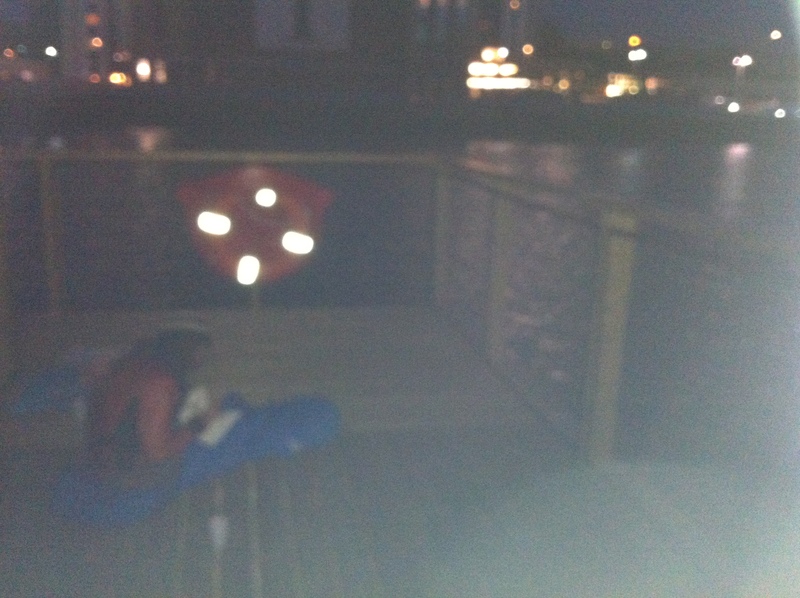 We were, essentially, sleeping rough on the quayside. I hadn’t thought about security, particularly, until I woke up about half one in the morning to find Kris standing up looking out through one of the small windows onto the quayside. A group of drunk, loud men and women were having a fight. It lasted a while. I got bored and went back to bed, so I missed the actual punching part. Kris didn’t settle after the fight. 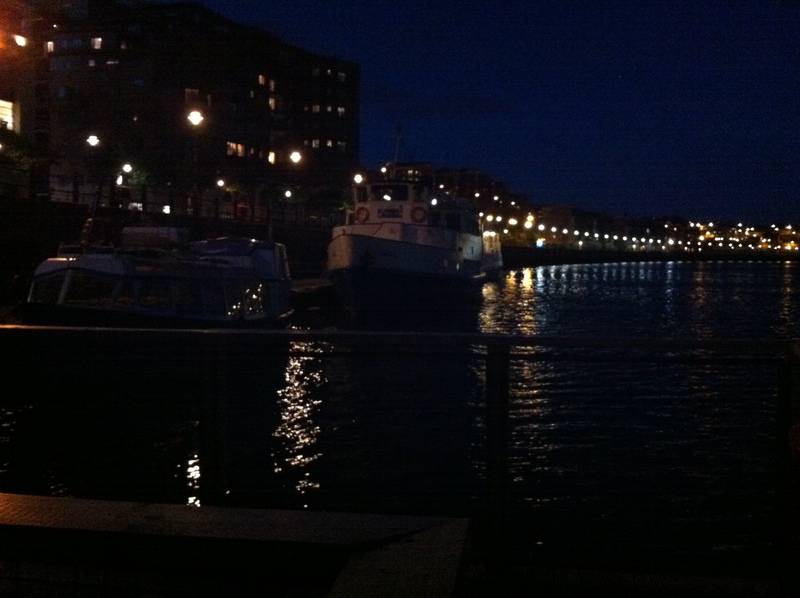 I was about to drift off, I think, when she whispered that there was someone on the pontoon. We sat, still and silent, and watched two men dressed in black approach one of the cruise ships moored right next to ~Flow. It was clear that they were attempting to break in. Suddenly the large gaps in the ‘walls’ became sinister. The padlocks felt insufficient. My phone was next to me, but I felt we were safer if the men didn’t know we were there- calling the police would alert them to our presence. It was creepy and strange, watching them a matter of metres from us. 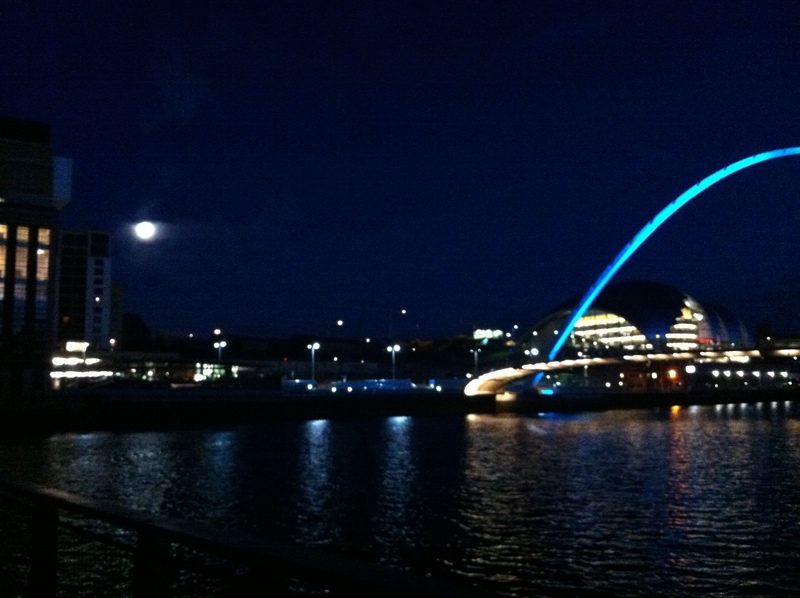 One of the men went back up onto the quayside, the other one lit a cigarette. We watched the red tip of it. It felt as though he was looking directly at us. 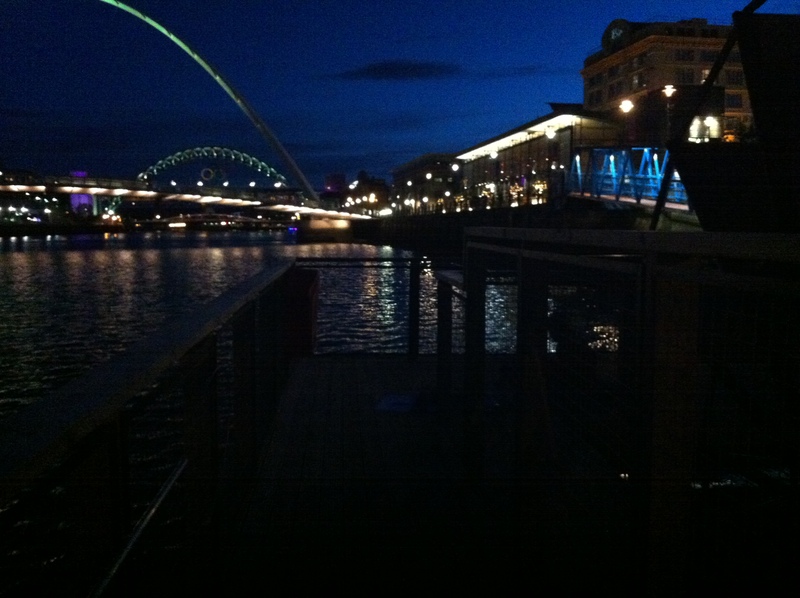 Then there were voices up on the quayside. A man wearing a tie came down onto the pontoon. We were lit up by the lights of the police, when they arrived. The burglars were gone, but I slept patchily for the rest of the night. Our vague plan to get up at 3am and sit out on the deck and write was disbanded: the expected darkness and silence never came. We woke at dawn and watched the light change. We had breakfast and made a few more notes, then packed up our gumph, translating the interior space back into its usual visitor-ready state. I was exhausted and slightly wired by the experience with the burglars. We locked up and left. 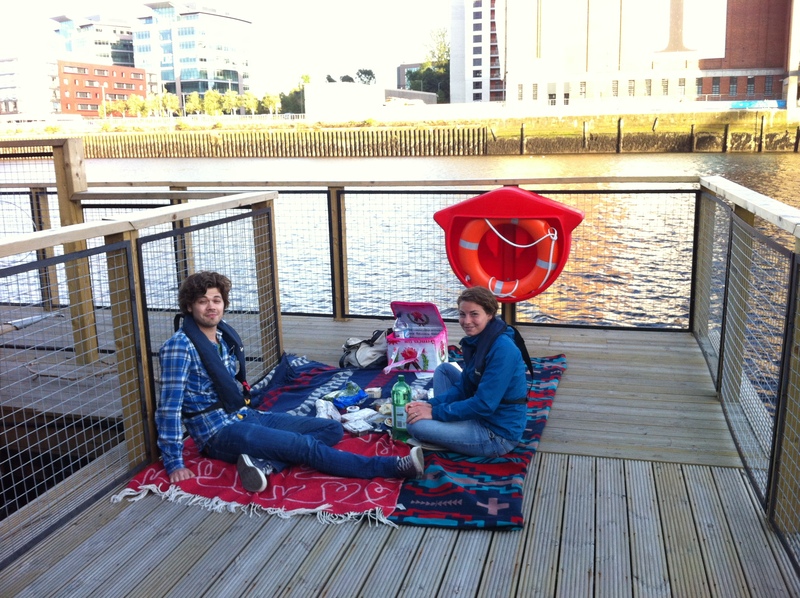 When we stepped onto the quayside we looked at each other and burst into laughter. 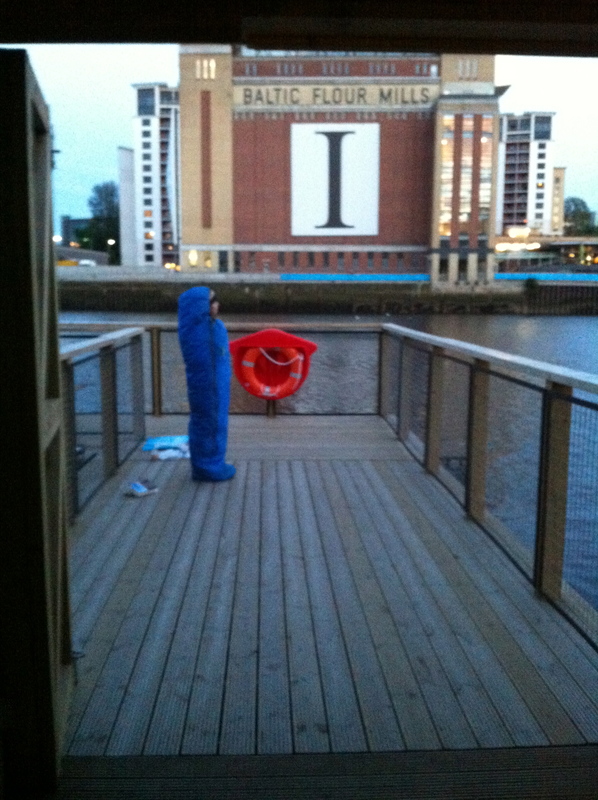 We gave the keys to the 24hr security people at BALTIC and headed home. The ~Flowvernight writing trip was an experience that has continued to grow in my head. I still feel as though I’m working out exactly how I feel about it. 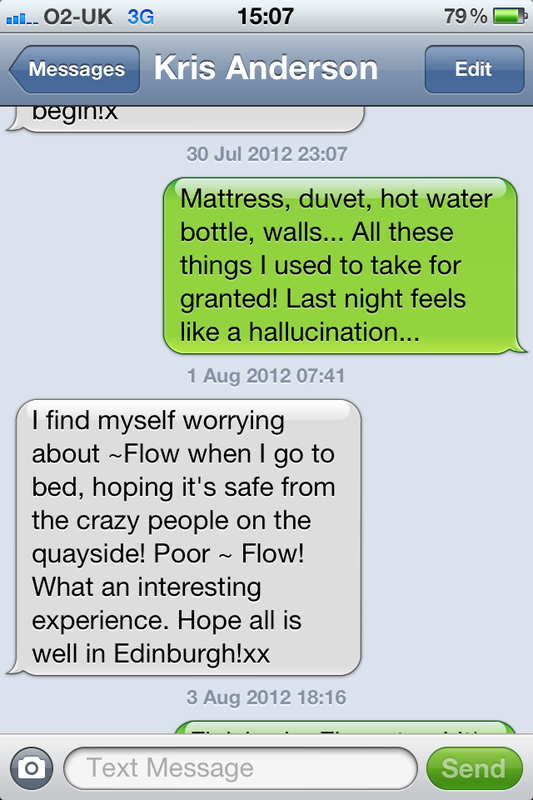 Kris and I texted each other in the days following, expressing sadness and concern for ~Flow. 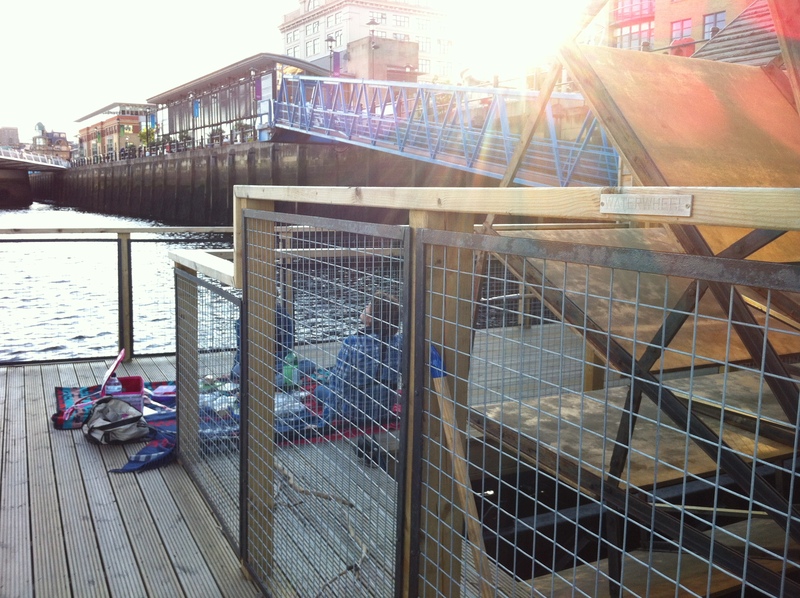 We wanted to rescue it from the continual noise of the quayside. From the ugliness of things like the burglary, the bawdy revellers, the piles of vomit on the pavement. As we were leaving ~Flow on the Monday morning, we talked about how our perspective of it had shifted- now we saw it as a structure rather than a dwelling, having experienced first-hand just how unsuitable it was. But we also talked about the minimal changes which would be necessary to turn it into somewhere fit for habitation. 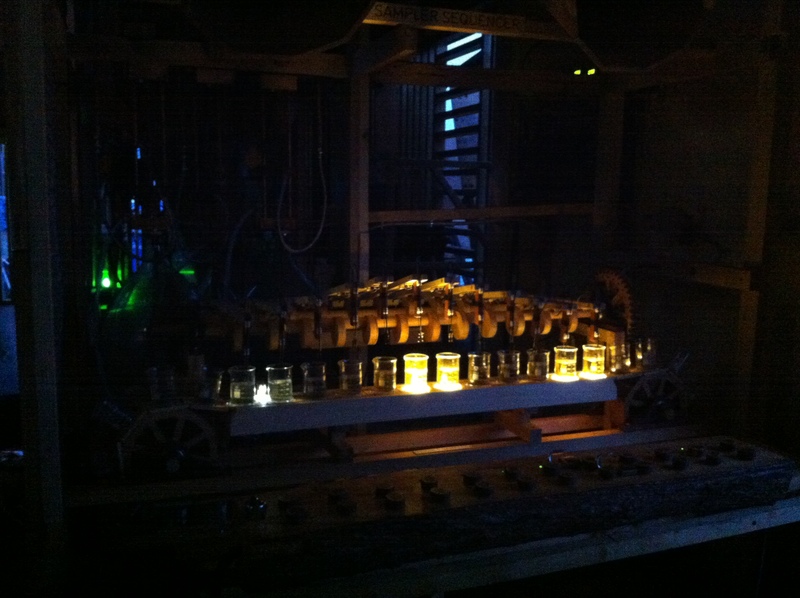 We definitely felt it had a personality- it made noises, we interpreted them as emotions. 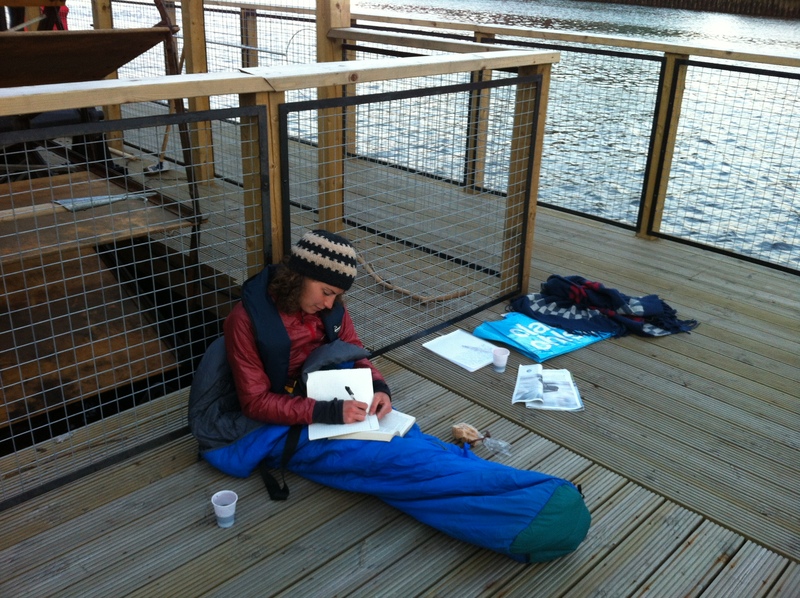 A couple of weeks after the ~Flowvernighter I sat down and wrote my Mermaid story. 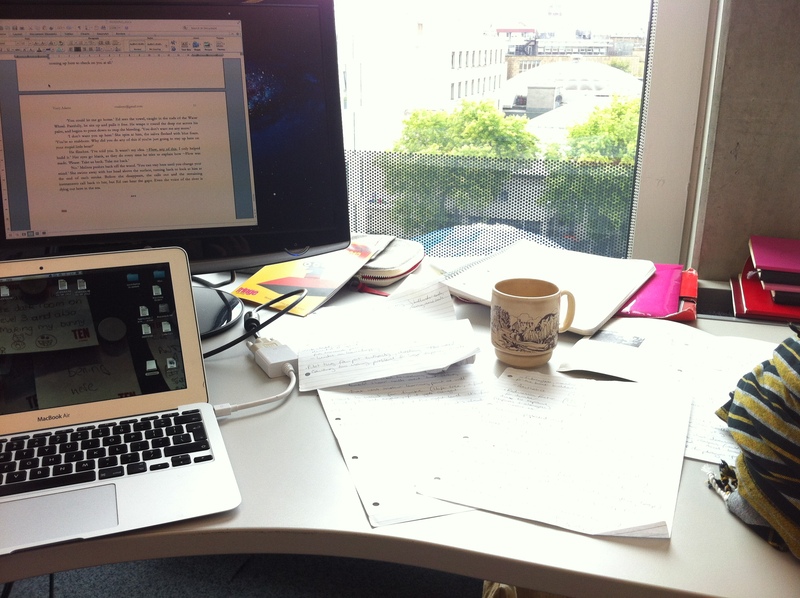 It took me three days to produce a full first draft, and the draft ended up a lot bleaker and longer than I’d expected. Although at the time I had wondered how useful the research trip actually was, how necessary it was for the story, I’m amazed at just how much of the narrative is directly inspired by that trip. I loved writing the story- it felt emotional and real for me. There’s something intrinsically sad about a temporary structure such as ~Flow, especially one with such innate character. It’s impossible not to impose hopes and expectations that don’t belong there, like Kris and my desire for the structure to be a house, for the house to be a home.